It’s a beautiful spring day, and you are totally ready to get outside, enjoy some fresh spring air and even start tackling the springtime yard cleanup. Amongst all the raking, mulching and paint touch ups, you come across what looks like an old dormant wasp nest hanging from the eaves of the house. Here are a few things you should know before you tackle this job on your own. 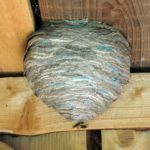 So the good news… if it is still early spring, most likely that wasp nest is an old dormant nest from the previous season. The reason being, that wasps never reuse the same nest over again and they do not overwinter in the nest either. The queen will find some warm and cozy nook, like a tree hollow to hide away in for the cold winter months. Therefore, most likely, if it is still early in the spring, the queens have not had a chance to become super active and rebuild their nest. If it is later in the season and you think the nest is a new active one, truthfully your best option is to contact a professional. 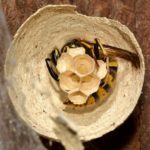 Wasp venom can cause severe, sometimes fatal reactions. Wasps can be aggressive and territorial, especially when provoked. 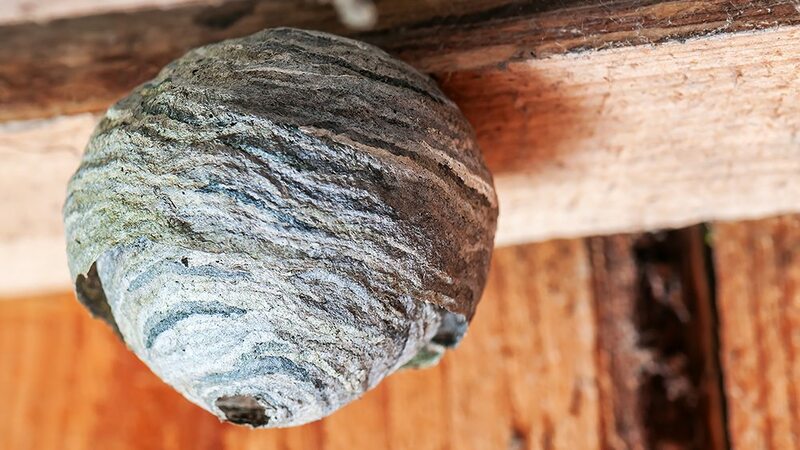 Pest management professionals have the skills and expertise to take the appropriate actions in permanently removing the wasps’ nest. If you are unsure if the nest is active or not, take some time to observe the nest. Especially at dusk when they are likely to return to the nest for the evening. If the nest is located high on the eaves of your house, you may need a sturdy ladder or a long telescoping handle that can aid you in reaching the nest. First, gently scrape away the nest and any residue. Be careful not to damage the surface it was attached too, assuming it is located on an object your wish to preserve. Additionally, it may be necessary to clean the surface, as the nesting material can be difficult to remove with scraping alone. A general cleaning solution, a stiff cleaning brush, pressure washer and/or vacuum can be useful tools for this purpose as well. Once the nest is removed, you can simply discard it. However, you may want to prevent future wasps from nesting on your home. For this, we recommend that you hire a pest management professional to regularly inspect your home and provide preventative treatment services. Modern Pest Services uses a “modern” approach to pest control with seasonal treatments, non-chemical monitoring, and exclusion techniques. We keep your home pest free while limiting exposure to pesticides! If you need help with wasps in your house or yard, contact Modern Pest Services.